It may be in the process of hiring a new CEO, but the MySpace machine keeps on rolling. Last month we got our first look at MySpace Local, the joint project between Citysearch and MySpace that combines the popular social network with Citysearch’s extensive database of business listings. The new property has quietly launched the public, and you can check it out here. While MySpace is relying on Citysearch’s massive database of business listings (which includes hours, addresses, photos, menus, and videos), it’s starting from scratch on the review side of things. That might have handicapped a smaller site, but given MySpace’s audience, it shouldn’t take too long for the site to get populated: since it went live seven days ago, MySpace users have already written over 60,000 reviews. 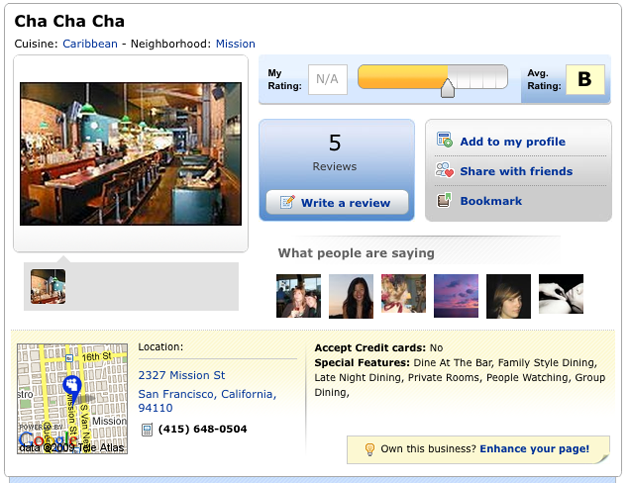 At launch MySpace Local is offering reviews on restaurants, bars, and other ‘nightlife’ listings, with more categories coming in the near future. The site is also going to begin to allow users to book reservations to restaurants in its directory. MySpace is taking advantage of its social graph to personalize the site as much as possible, highlighting reviews left by your friends and syndicating your actions (such as writing a review) back to your MySpace activity steam. Because the reviews are being written by the people you know, you’re more likely to look at them and leave one of your own. These features are certainly appealing, but why is MySpace creating a new destination site when MySpaceID could presumably do many of the same things (Citysearch integrated Facebook Connect in December)? MySpace says that while MySpaceID is coming to Citysearch eventually, the two sites will likely appeal to two different audiences, which is why Citysearch was on board in the first place. Because MySpace Local is directly connected to the social network, users can jump to it seamlessly without having to worry about logging in. Through MySpaceID, users would still have to go through a brief authentication process, which raises the barrier to entry (and is still a fairly novel concept for most people). The other reason why MySpace is building out its own product? Advertising. 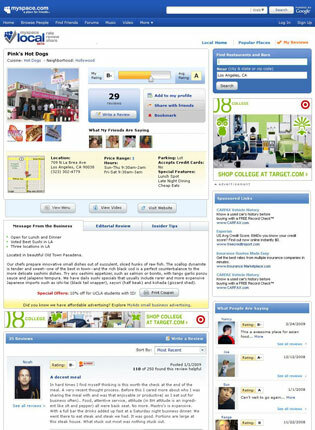 The site allows local businesses to take advantage of MySpace’s self-service MyAds product, which will allow them to selectively display their banner ads to local MySpace users. This opens up MySpace (and Citysearch, which is participating in a rev-share deal) to new sources of revenue from both local establishments and national brands, like Coors and Outback Steakhouse.